It’s that time of the year again. A whole new class of young adults has walked across the stage, tipped their cap and left the cozy walls of college for a life outside the ivy walls. Now what? It’s time to take that degree, find a place to live and a job. According to Trulia, college students have the best bet to find an affordable place to live and a job in the East or Midwest. 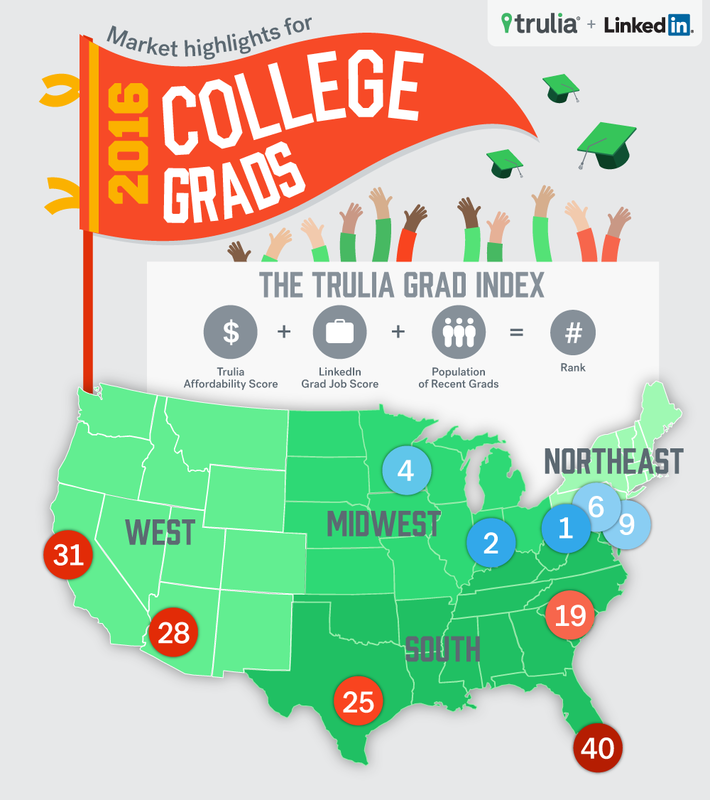 The Graduate Opportunity Index was created through efforts by Trulia and Linkedin to find the best combination of available entry-level jobs, a large population of recent graduates and affordability. The New Grad Affordability Score is based on the number of apartments in a specific area considered to be affordable for grads. While California and other cities along the West Coast are known for high-paying jobs, those same communities are known for their high cost of living. The Graduate Opportunity Index found that the East is best for recent graduates. Coming in No. 1 as the best market for college graduates in 2016 is Pittsburgh. The city received a Trulia New Grad Affordability Score of 91.8 and it has a new college grad population of 5.3 percent. Midwestern cities took the cake as the best places for recent grads. Indianapolis, Kansas City, Minneapolis-St. Paul, Nashville and Chicago were among the best listed. Chicago is home to a new grad population of 5.6 percent, which is the largest share reported alongside Philadelphia with the same share. Chicago received a Trulia New Grad Affordability and Score of 89.6 and Graduate Opportunity Index of 0.67. Of the 10 top worst markets for recent grads, nine were located on or near the Pacific. And the other? Miami. Eight of the 10 metros are located in California and the final city to make the list was Portland. Miami ranked No. 40, which is the weakest market measured for college grads in 2016. With 3.2 percent of its population comprised of recent graduates, Miami received a Graduate Opportunity Index score of 0.19. Los Angeles and Orange County were ranked right above Miami with a Graduate Opportunity Index of 17.7 and 6.1, respectively. The Bay Area ranked as the highest on the list of weakest markets. San Francisco came in No. 31 out of the 40 markets measured. Oakland and San Jose were ranked No. 34 and No. 35. However, New York still isn’t very affordable, either; the Big Apple was No. 26 on the list, with a Graduate Opportunity Index of 0.45. Median income for a new college grad was $35,000, and median monthly rent was $2,500. However, San Francisco still ranks as the market with the highest median income for new grads. The median college grad income is $48,000. But new grads will have to consider the median rent that is estimated at about $4,500. Washington, D.C., and Balitmore rank as two of the markest with the highest median income for recent college grads at $41,000 and $37,000, respectively. The Trulia gives the nation’s capital an affordable score of 88.6 and median rent of $2,200, while nearby Baltimore got a score of 91.3 and median estimated rent of $1,700. Three Texas cities ranked on the list as well: Houston, Dallas and Austin all ranked for decent incomes for new professionals. Houston was ranked no. 3 on the list with a grad income of $40,000 and median rent of $3,700. While incomes were reported lower in Dallas and Austin, rent was also reported to be lower.